Long-time cannabis entrepreneur Greta Carter made a big career decision recently: She sold her Seattle marijuana business, gave up her Washington State residency and moved to Desert Hot Springs, California. “I thought I could get a much better return on the time and money in California than in Washington,” Carter said. Carter is one of many cannabis entrepreneurs planting their business stakes in Desert Hot Springs, which is hoping to become a major cultivation hub for the marijuana industry. As the first municipality in California to authorize and regulate cannabis cultivation in 2014, Desert Hot Springs has gone from a sleepy, nearly bankrupt town to a marijuana magnet where scores of entrepreneurs are launching operations or exploring how to get a foothold in the market. Several large-scale projects and many more smaller ones are being built out as entrepreneurs look to build several million square feet of cultivation space in the town, generating a fair amount of buzz within the industry and throughout California. Town officials have won praise for their mostly canna-business friendly regulations, and many entrepreneurs see it as an ideal place to set up a cultivation operation given its proximity to the massive Los Angeles market. But for all the hype, not a single cultivation business has opened yet, entrepreneurs are running into infrastructure issues and some industry insiders question whether many of the projects will come to fruition. Getting into the town’s cannabis cultivation industry isn’t cheap: Carter estimates that it requires in the high seven-digit figures. Yet there are still plenty of entrepreneurs looking to get involved. Carter and her financial partner are building a 30,000-square-foot cultivation site in Desert Hot Springs and also bought a building in nearby Cathedral City, which recently approved a cultivation ordinance. Carter and other observers estimated that about 90% of the cannabis entrepreneurs in the area are from California, and the rest from other states, including one prospector from Germany. Along with the business opportunities, Carter sees a chance to help shape the town’s and California’s marijuana regulatory system. “California is where Washington State was three years ago,” Carter said. As examples, she pointed to “undefined state regulations” and many municipalities putting moratoriums on marijuana business. At the moment, Desert Hot Springs has agreements with six developers who are renovating existing buildings for cultivation, and all should be open in a few months, said the city’s mayor, Scott Matas. The town also has agreements with another six developers who have purchased land on which they plan to construct their grow sites from the ground-up. It’s less clear when these operations will get off the ground. Between them, the 12 sites encompass close to two million square feet, ranging from 1,800 square feet to about one million square feet held by Oxford Properties, which plans to develop the site piecemeal over several years so that at least some of the land is generating income while the rest is still being built out. Other major companies that have land approved for cultivation include G FarmaLabs, MedMen, and Schneider Investments. Another 10 cultivation applicants could be approved in the next six months, Matas noted, which could bring the city’s cultivation square footage to about three million. Almost all of the available land for cultivation has been bought, but if there is demand – say if recreational legalization passes in November – if another one million square feet of industrial space in the city could be zoned for cultivation, Matas said. There are also five dispensaries in town. Several more businesses are applying for dispensary alliances, though Matas expects only one or two will be granted because of saturation. The relationship between the town and cannabis businesses has been good for both sides, with entrepreneurs being embraced in a state where scores municipalities have rejected them with moratoriums. Desert Hot Springs expects marijuana businesses will bring in $20 million in annual tax revenue – more than its total current annual budget of about $15 million. Marijuana entrepreneurs and town officials have also so far struck up a cordial and cooperative relationship that could serve as an example to other municipalities where industry-local government relations have been acrimonious. But not everybody sees Desert Hot Springs, population 28,000, as the place to be. In large part that’s because many of the properties that have been zoned – and in many cases bought – for cannabis cultivation in parts of the town that don’t yet have electric, water or sewer infrastructure. “In my professional opinion, many of the projects that have been approved there will not transpire either due to a lack of funding or a lack of capital,” said Aaron Herzberg, chief counsel at CalCann Holdings, a cannabis cultivation leasing company in Costa Mesa, California that also has a 2.5 acre plot of land in Desert Hot Springs earmarked for a greenhouse and processing lab. 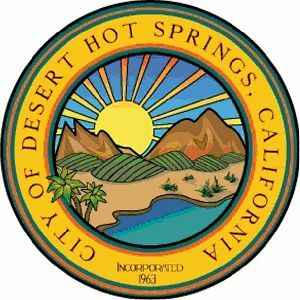 While Herzberg noted that Desert Hot Springs has the potential to be a lucrative location for marijuana cultivators whose main market would be Los Angeles, about two hours away, it could soon be overtaken by other towns that may pass cultivation ordinances and are even closer to LA. He also acknowledges that there are infrastructure problems to confront. While utility company Southern California Edison told Matas it could provide power to existing buildings, getting electricity to properties without buildings could be challenging. Indeed, Matas noted that some areas will require studies that could take two or three years before they are ready for construction, not to mention the time needed for the infrastructure construction. Rather than waiting, Oxford Properties has set aside an acre of land on which to build a substation to power its complex, at a cost of about $3 million, Matas said. While expensive, the substation would be a fraction of the roughly $500 million Oxford plans to spend on the project, which it plans to build out over several years. Whatever Desert Hot Springs lacks in infrastructure, town officials have tried to make up for it with a willingness to work with local industry people. For example, the city’s current ordinance doesn’t allow extraction laboratories in some zones. But when the Desert Hot Springs Cannabis Alliance Network, a new non-profit trade organization that Carter helped create, complained, Matas said town officials listened and are now working on a new ordinance that will allow extraction labs at an expanded number of cultivation zones, Matas said. “Everybody came to the table and talked,” Matas said. So despite the challenges to Desert Hot Springs becoming a true cannabis cultivation mecca, the atmosphere is cannabis-friendly. “There’s a great political climate here,” said Carter, who is the executive director of the new trade group, and said her next cause would be lowering taxes. “The taxes are still too high in Desert Springs, as they are in most communities, but once people see cannabis is nothing more than another agricultural product, they’ll treat us like regular business people,” Carter said.